To quote a close family member, fellow blogger and amazing friend, ‘you like to make weird stuff, not the usual foodie things.’ I kind of agree but think if I did make just the usual things all the time, I wouldn’t half the Food Nerd I am today. So after being introduced to the most insane place to do your food shop by a work friend, which turned out to be Costco wholesale, the place where if you can store kilos of things, you’ll be quids in. (For months we’ve had 46 loo rolls hiding everywhere in my tiny flat – but hey they were on offer!) Managed to stock on the essentials, giant lemons (used for my lemon curd), 2kg of quinoa and enough toothpaste to sink a battleship! 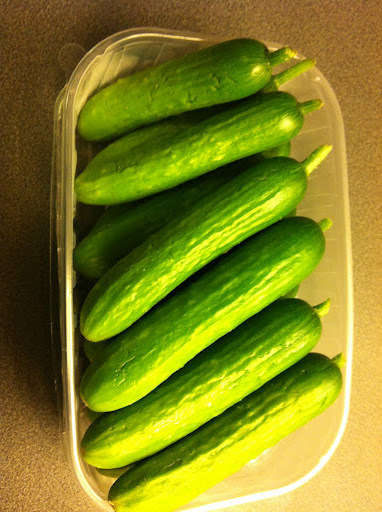 But also found in the fruit and veggie section, snacking cucumbers! Now I’ve been wanting to make my own gherkins for a long time, as my obsession for eating them straight out the jar has hit new heights over the last year. Luckily the pack was exactly the right amount to make a jar of them for a first attempt. So below is the recipe I used as a reference, adapted from Jams and Preserves by Nerys Purchon. Want to try them now….. Mix the salt and water in a bowl until the salt has dissolved. I trimmed the tops of the cucumbers just so they would fit into my jar but you can leave them with a little amount of stalk if you like. Add the gherkins to the brine and leave for 12 hours, covered, stirring often. I left mine overnight and they were perfectly fine with a stir every couple of hours but it’s really up to you. 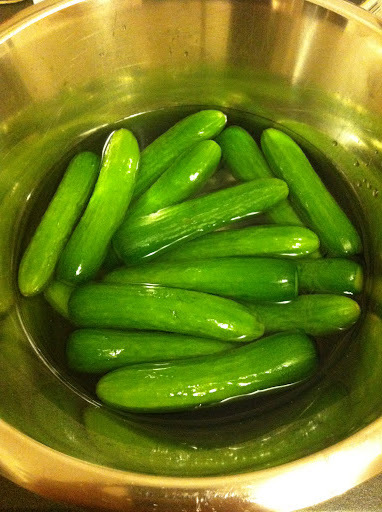 Drain and rinse the gherkins well under fresh water and leave to drain. 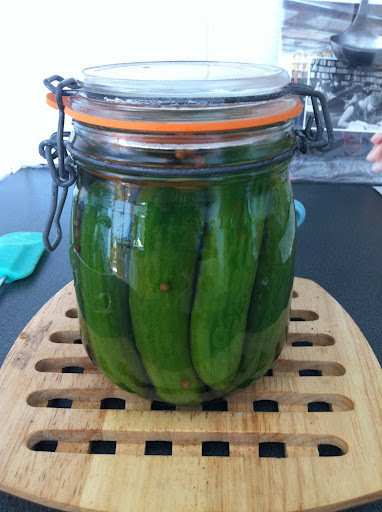 Sterilise a large kilner jar that will hold all the gherkins snugly, while they drain. If you need to know how to sterilise the jars, check out the link to my lemon curd post above. 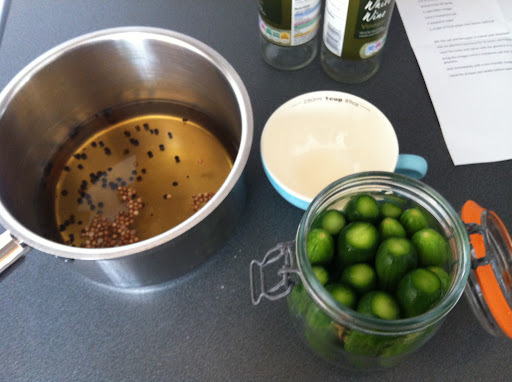 In a sauce pan, add the extra salt, sugar, vinegar, peppercorns and coriander seeds (or mustard seed), bring to the boil and carefully pour over the packed gherkins in the jar, including the peppercorns and coriander seeds. Seal the jar whilst the brine is still hot and leave to cool. These lovelies need to be stored in the dark for 2 months before trying – upsetting I know that you can’t tuck right it, but I hear patience is a virtue. So in two months time, I’ll post an update as to whether they were a success or not- here’s fingers crossed! 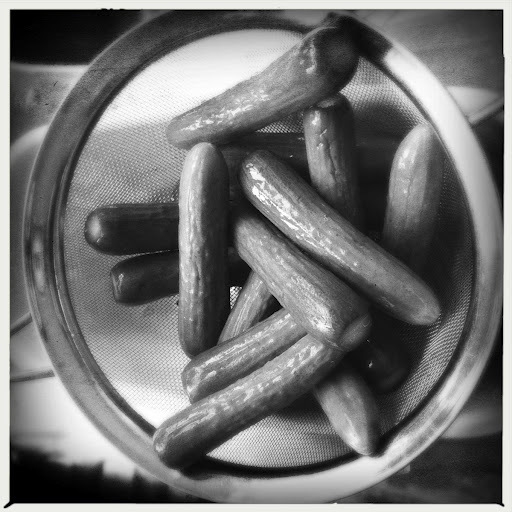 Yum I love Gherkins. Glad to hear I am not the only person who eats them straight from the jar!